Clear Height Stables, opposite the home of the Derby and on the very edge of London, is perfectly located for true engagement as an owner. Where else can you watch your horse train on the way into the city! Simon commits to the highest standards of care and with access to the top grade gallops of Epsom Downs, provides the essential foundations to develop your horse’s potential to the maximum. Communication and engagement are key and Simon limits numbers and tailors his service to ensure that his owners come first. We have two potential runners this week: Mr Scaramanga and Pacificadora. Mr Scaramanga is due to run on Good Friday in the 13.30 Sun Racing All-Weather Championship Apprentice Handicap, over 7f, with Levi Williams taking the ride. This son of Sir Percy won at Lingfield, four starts back under the same jockey, providing him with his first victory as an apprentice. Unfortunately, he has failed to follow that up since. He was last seen running over one mile at Lingfield. He got a nice position in mid division on the rail under Adam Kirby who managed to get him settled better than he had been on his previous two starts. He was still travelling well turning for home but had a wall of horses in front of him. He got a nice spilt a furlong and a half from home but was not able to quicken up well enough to challenge the eventual winner. He didn’t finish too far behind those that filled the places and it was a creditable effort. He has come out of that race in good order and if he could find some of his old spark he could run a good race, in what will be a super competitive handicap. Pacifadora could be entered on Saturday, at Kempton in the 14.35 Racing TV Fillies’ Conditions Stakes (Plus 10 Race), over 1m. This Declaration Of War filly is an exciting prospect for Clear Height after running exceptionally well first time out to finish third of fourteen in a novice event at Kempton, showing plenty of inexperience and then winning at the second time of asking. Last time out at Chelmsford she broke alertly and was settled in mid division by Nicky Mackay. She was far more professional through the early stages than her previous run but still showed signs of greenness through the mid part of the race, coming on and off the bridle and looking slightly off balance. She turned in to the straight and had to come widest of the field to mount her challenge. She quickened up very nicely and looked to have a little bit in hand at the line. The form of that novice stakes does look suspect with the second and third both finishing last on their next starts but the fourth horse has won and finished second, twice. She could only beat what was in front of her on the day and is bound to come on again for that experience and the step up in trip looks sure to suit. She has got an Oaks entry but there is an awful lot of water to go under the bridge before then. We are likely to have four runners on Grand National Day, albeit, at Lingfield on the all weather: Chica De La Noche, Emenem, Subliminal and Thora. Chica De La Noche could be our first runner on the card. She is going to run in the 14.00 Ladbrokes Home Of The Odds Boost Fillies’ Handicap, over 7f. Adam Kirby has been booked to ride her. This Teofilo filly has been the model of consistency of late and although she finished out of the places last time out, for the first time in a long time, she was only a length and three quarters behind the eventual winner. She broke well and was settled in behind the leaders. She had every chance turning for home and stayed on in the last furlong after getting out paced two out. It was another creditable run in a more competitive race and she has been dropped a pound for that effort. She has come out of that race in good order and continues to train well at home. If she is in the same form on Saturday she should run well once again. Emenem is likely to take his chance in the 15.10 Betway Live Casino Handicap, over 1m 4f, with Tom Marquand taking the ride. This Sir Percy gelding was very progressive two seasons ago but struggled to win last year, despite running well in defeat. He broke well last time and took a prominent position just in behind the leaders. He travelled well and had every chance turning for home but stayed on rather than quickened to finish third of seven. It was a decent run but a few of our runners haven’t been finishing off their races recently and he was one of them. He is well handicapped on old form and if he was to come back to form at the weekend he would have a decent chance. Subliminal could take his chance in the 16.50 Betway Heed Your Hunch Handicap, over 1m 2f, with Tom Marquand booked again. This Arcano colt has been in good form of late and got the first win of his career on his penultimate start. He then went on to finish second of eleven at the end of March when beaten by another Epsom trained horse. He broke well and found a lovely position behind the leaders. He travelled well and had no excuses in the straight, despite the eventual winner getting first run on him. He had every chance to get past in the last two furlongs was unable to get his head in front. That was another good run but he’ll find himself running off four pounds higher at the weekend which will make his life more difficult. Thora will be the last runner on the card. She goes in the 17.45 Ladbrokes Home Of The Odds Boost Novice Stakes, over 1m 2f and we are lucky to have Tom back in the saddle for her too. This Iffraaj filly made her racecourse debut at Kempton towards the end of March, over one mile, at Kempton. She was slowly away and showed signs of greenness early on. Bentley pushed her up to take a more prominent position in the first couple of furlongs and she soon settled her in mid division. She travelled well and was in with a chance turning for home but was slightly awkward at the business end and faded to finish seventh of eighth. She has come out of the race well and would have learnt a lot for that. She is bred to appreciate middle distances in time so the step up in trip should be in her favour. We have three potential runners this week: Le Torrent, Corazon Espinado and Chica De La Noche. Le Torrent is due to run today at Lingfield in the 15.30 Betway Live Casino Handicap, over 2m, with Tom Marquand riding. This Sir Percy gelding has a very progressive profile, winning six of his last nine starts. He was not seen to best effect last time out in an apprentice race where he lost his position early on and was then struggling for the rest of the race. He is none the worse for that run and is relatively unexposed given his age. He is three from three under Tom Marquand so we are hoping their productive relationship can continue. Corazon Espinado is likely to run at Kempton on Wednesday, in the 19.30 32Red.com Handicap, over 7f, with Tom booked to ride again. This Iffraaj colt was progressive as a three year old last year winning on four occasions. He started life in handicaps off a mark of 62 and finished the year off 87. He ran with credit on his seasonal reappearance at Kempton in early March, finishing fifth of ten. He looked competitive for the majority of the race but just got tired in the last couple of furlongs. He is sure to strip fitter for that run so we are hoping he can run well. Chica De La Noche has a couple of options but is likely to run at Chelmsford on Thursday, in the 19.30 Gepp Solicitors Fillies’ Handicap, over 6f. This ultra consistent filly has finished in the frame on her last ten starts, winning two of them. She got another very well deserved win to her name last time out when rallying very well over course and distance. She broke well and Kirby got her in to a nice position just in behind the leaders. She travelled well but turning for home she looked like she was booked for a place at best after coming off the bridle at an early stage. Kirby was inspired in the last two furlongs and really got her running for him and in the end she got up on the line to score by a head from a filly that had previously beaten her. She has crept up the weights again and is now off a mark of 66 but she is in such good form at the moment we are hoping she can run well once again. We have had a quiet week but all of the action is happening today and we are likely to be busy with five runners. Mr Scaramanga is the first runner of the day. 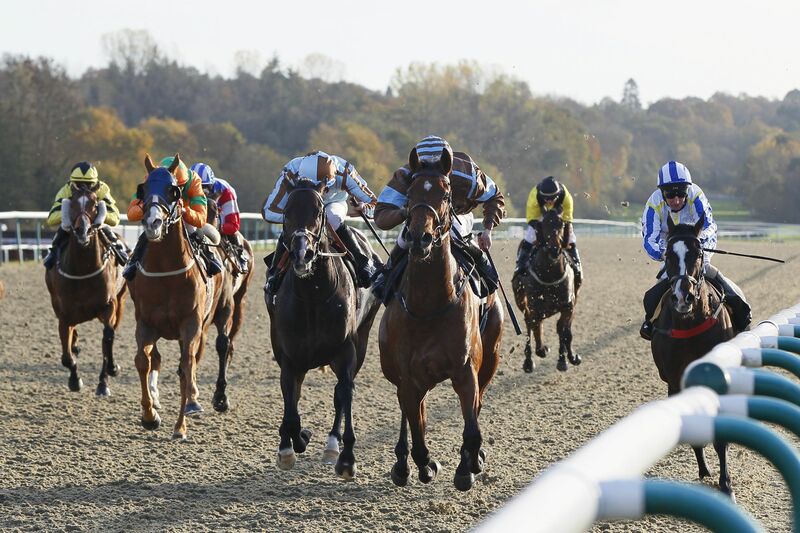 He heads to Lingfield in the 15.10 Sun Racing No 1 Racing Site Handicap, over 1m, with Adam Kirby taking the ride. This Sir Percy gelding won three starts ago when just getting up on the line under 7lb claimer, Levi Williams. He then struggled to follow up on both occasions after that after being poorly placed. He was very keen last time out and gave his jockey a difficult time when stuck out wide. You can probably put a line through that run and with Kirby in the saddle he should have every chance of 1lb higher than his last winning mark. Subliminal also heads to Lingfield tomorrow. He goes in the 16.55 Betway Live Casino Handicap, over 1m 2f, with Tom Marquand taking the ride. This Arcano colt is a last time out winner and has progressed well of late. He broke well and Marquand got him in a lovely position, settled in third position, after a furlong. He lost a couple of positions during the middle of the race and travelled kindly in fifth after that. Turning for home he got a lovely tow in to the race and hit the front two furlongs from home. He was there to be caught in the home straight but battled on gamely and in the end score by a neck. That was a well deserved win and he has gone up 3lb for that effort. A similar effort should see him go close once again. Recuerdame heads our team that go to Kempton tonight night. He runs in the 17.25 100% Profit Boost At 32Redsport.com Handicap, over 7f, with Louis Steward taking the ride. This US bred colt broke his maiden in a weak four runner handicap at Chelmsford and then failed to fire on the turf at Goodwood in August. He has been given a nice, long break since then and has done well for that. He has grown and strengthened and given his pedigree we are hoping that he could be a nice horse for the all weather over the coming months. Thora is going to start her career at Kempton tomorrow evening. She will run in the 18.30 32Red On The App Store Fillies’ Novice Stakes (Div I), over 1m, Harry Bentley will take the ride. This Iffraaj filly is a welcome recruit from Woodcote Stud. She is out of an Authorized mare so is likely to get a trip in time but she is a nice type with a lovely pedigree and although she is likely to need the run she should be interesting to follow for the season. El Borracho finishes off the day. He goes in the 20.30 32Red.com Handicap, over 1m 4f, with Tom Marquand taking the ride. This Society Rock gelding had been off the track for 139 days prior to his latest run and just shaped as if in need of it. He broke well but was held up as usual and travelled with plenty of zest for Hollie Doyle. He was still in touch with the field turning for home but didn’t quicken in the last two furlongs. He is likely to come on for that run and his performances over course and distance were pretty consistent in the autumn months. We have four potential runners this week in the form of Te Amo Te Amo, Corazon Espinado, Subliminal and Chica De La Noche. Te Amo Te Amo is going to run today at Kempton in the 17.00 100% Profit Boost At 32Redsport.com Novice Stakes, with Tom Marquand booked. This Kyllachy colt is having his fourth career start at Kempton. He ran very well on his second start to finish fourth of thirteen, over seven furlongs. He struggled to follow up on his next start after taking the field along at a fast pace. It will be a slight experiment today in terms of dropping him in trip once again but we are still finding out about him and this should give us an indication of where we go next. Corazon Espinado is also due to run today. He runs in the 19.00 32Red.com Handicap, over 7f. Tom takes the ride again. This Iffraaj colt more than paid his way last year winning four times, including twice at our local track. He progressed from a mark of 69 to a current mark of 87 during the year and has a lovely profile. He was also placed on five other occasions. He has been given a break since October and he is looking very well for it. He has grown and strengthened up so we are hoping that he will continue his progression this year. Subliminal is entered at Lingfield on Wednesday, in the 17.15 Betway Best For Cheltenham Festival Offers Handicap, over 1m 2f, with Tom in the saddle again. This Arcano colt has had four starts for Clear Height and has run creditably on each of his starts. Last time he was seen running at Kempton over 1m3f. Marquand was in the saddle for this race as well and gave him a great ride from a wide draw. He was quick away from the stalls and gradually got himself to the front of the field. He travelled a lot better this time around and got in to a good rhythm on the front end. He had every chance in the home straight and stayed on well rather than quickened but it was another decent run. He has been dropped another two pounds for that which should aid his chance next time out. Chica De La Noche will head to Kempton on Wednesday. She goes in the 20.15 Bet At racingtv.com Handicap, over 7f, with Adam Kirby taking the ride. This Teofilo filly is an unbelievable mare in her grade and has now finished in the money on her last ten starts. She got another very well deserved win to her name last time out when rallying very well over course and distance. She broke well and Kirby got her in to a nice position just in behind the leaders. She travelled well but turning for home she looked like she was booked for a place at best after coming off the bridle at an early stage. Kirby was inspired in the last two furlongs and really got her running for him and in the end she got up on the line to score by a head from a filly that had previously beaten her. She has crept up the weights again and is now off a mark of 66 but she is in such good form at the moment we are hoping she can run well once again. © 2017 simondow.co.uk. All Rights Reserved.